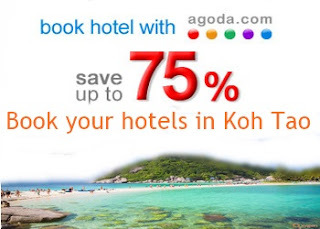 Koh Tao located in the Gulf of Thailand and getting to here by boat only because on the island does not have the airport or bus terminal but easier to connection from bus and ferry, train and ferry or night ferry to Koh To. By Bus + Ferry: Most recommended! And more convenience with air con bus from Khao San road, with Lomprayah company they all sell tickets for both bus and ferry tickets. By Train + Ferry: Comfortable with sleeping train, trip starting from Hualamphong Train Station in Bangkok then train will arrival at Chumphon and you can catch the transfer with Lomprayah bus and get through the pier at Chumphon and connect with the first ferry in 07.00 am. By Night ferry to Koh Tao : At Chumphon have night ferry leaving from Pak Nam pier leaving at 11.00 pm. on the ferry has air conditioned room service for passengers with upper and lower bed.